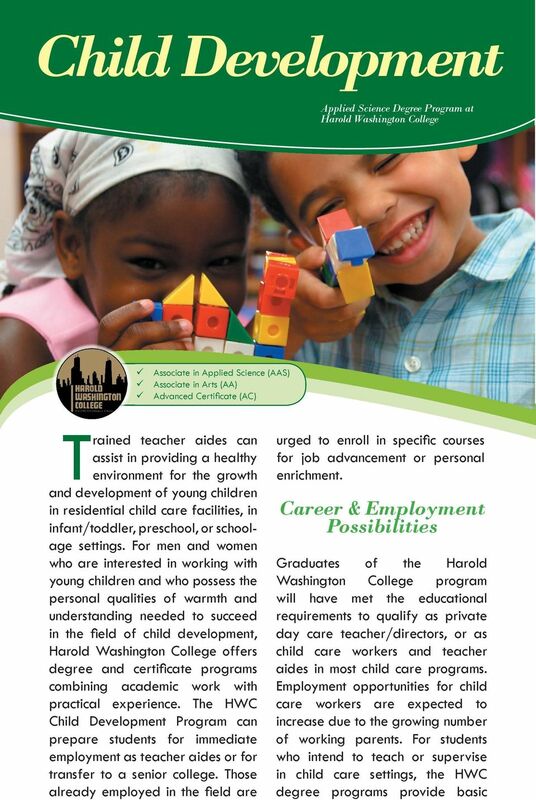 Download "Trained teacher aides can. Child Development. 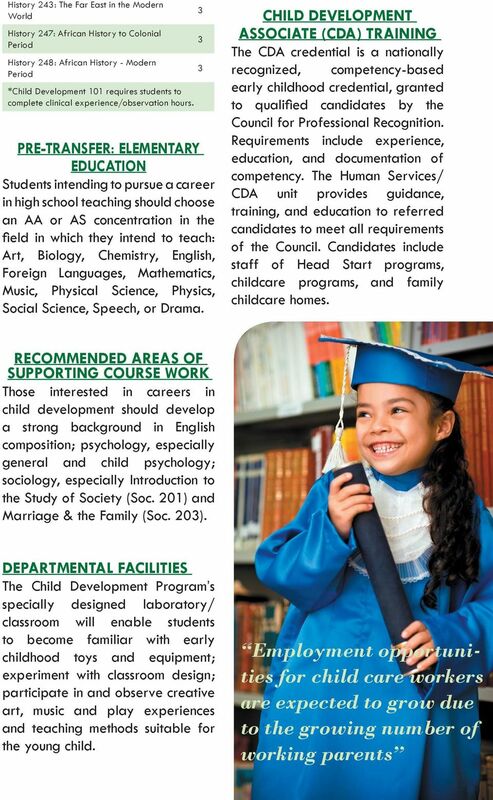 Career & Employment Possibilities"
2 background for transfer to a fouryear college. 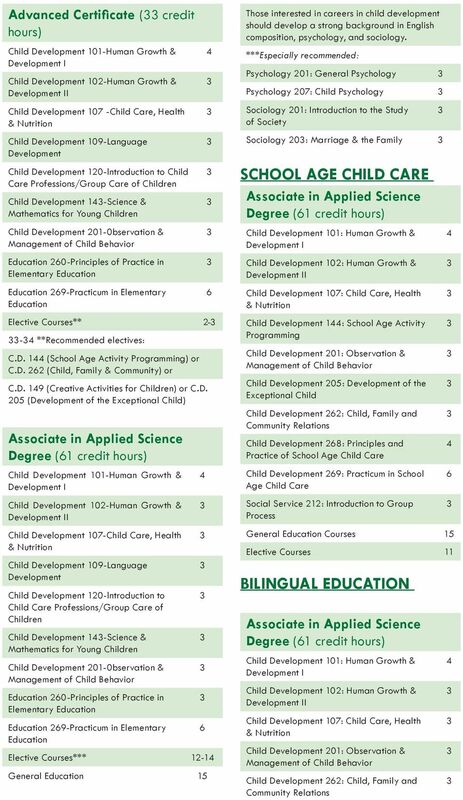 Degree & Certificate Programs INFANT/TODDLER CARE: For careers in center or home based programs providing day care for infants and toddlers; study of child development theory and skills necessary for those interested in becoming nannies or live-in infant and child care providers. 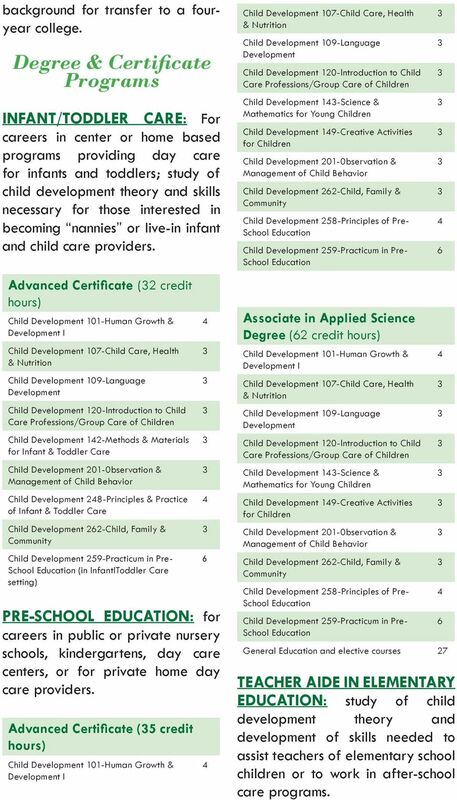 Advanced Certificate (2 credit Child 101-Human Growth & Child 107-Child Care, Health Child 109-Language Child 120-lntroduction to Child Child 12-Methods & Materials for Infant & Toddler Care Child 201-0bservation & Child 28-Principles & Practice of Infant & Toddler Care Child 22-Child, Family & Community Child 259-Practicum in Pre- (in InfantIToddler Care setting) PRE-SCHOOL EDUCATION: for careers in public or private nursery schools, kindergartens, day care centers, or for private home day care providers. 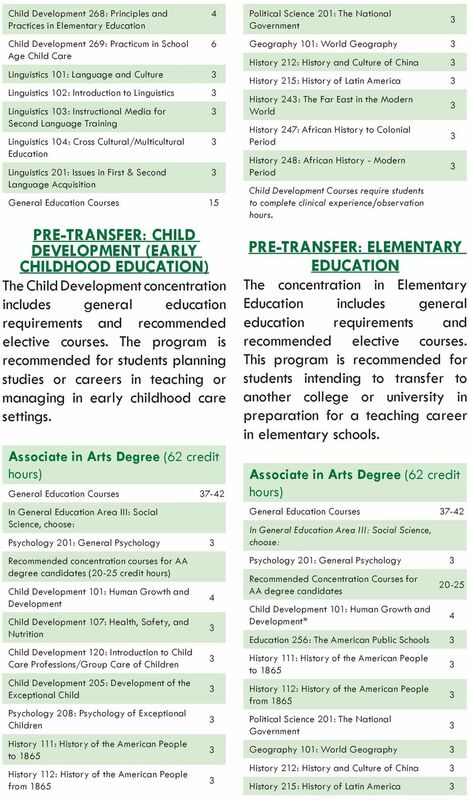 Advanced Certificate (5 credit Child 101-Human Growth & Child 107-Child Care, Health Child 109-Language Child 120-lntroduction to Child Child 1-Science & Child 19-Creative Activities for Children Child 201-0bservation & Child 22-Child, Family & Community Child 258-Principles of Pre- Child 259-Practicum in Pre- Degree (2 credit Child 101-Human Growth & Child 107-Child Care, Health Child 109-Language Child 120-lntroduction to Child Child 1-Science & Child 19-Creative Activities for Children Child 201-0bservation & Child 22-Child, Family & Community Child 258-Principles of Pre- Child 259-Practicum in Pre- General Education and elective courses 27 TEACHER AIDE IN ELEMENTARY EDUCATION: study of child development theory and development of skills needed to assist teachers of elementary school children or to work in after-school care programs.